An orchestra is more like a sports team than you might imagine. If a lone violinist starts a piece two beats before everybody else, you’re bound for disaster. If an athlete grandstands to the detriment of a team effort, defeat lurks. 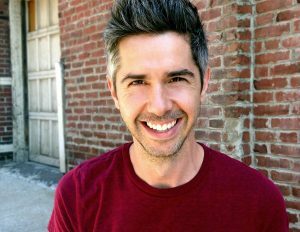 These simple truths form one of the premises of the Kansas City Symphony’s upcoming Family Concert Peter and the Wolf, Live! featuring Prokofiev’s 1936 musical fairy tale and other sports-themed works. 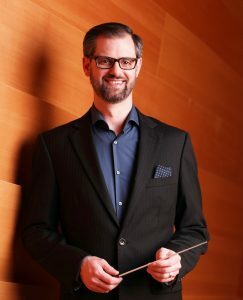 The brainchild of Stephanie Brimhall, the Symphony’s Education Manager, and Associate Conductor Jason Seber, the concert also includes Peter Schickele’s New Horizons in Music Appreciation, an ingenious parody of Beethoven’s Fifth Symphony in which sports announcers give play-by-play commentary on the music. (“And they’re off! … with a four-note theme!”). 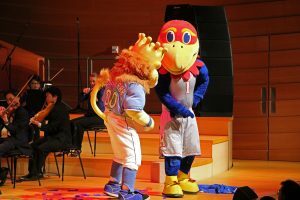 As with all of the Symphony’s multifarious education programs, the goal is to engage and inform while not diluting the mission of bringing great music of all kinds to Kansas Citians. The Kansas City Symphony’s education department has blossomed to nearly a dozen series focused on children and families. An orchestra is, after all, a team effort, and as such is an ideal model for the kind of sharing and collaboration we try to teach our kids every day. In addition to Family Concerts, the Symphony also presents Petite Performances (infant through age six), KinderKonzerts (kindergarten through second grade), Young People’s Concerts (grades three through six), Open Rehearsals (middle school through college), and many others. Together they reach over 30,000 youngsters annually, partly with the aim of opening up minds before musical prejudices set in. Yet the goal of an orchestra’s outreach programs these days is not simply to get them into the Classical Series, as was generally the case for earlier models. Today’s orchestras are embracing a wide range of styles and genres, without judgment as to which is loftier or more useful to listeners. Orchestras do find, of course, that listeners who have a positive experience at one type of concert are likely to try something else: And they often find that John Williams’ film scores are not so different from something they might hear in a “classical” concert. Thus the concept of Young People’s Concerts espoused by Leonard Bernstein and the New York Philharmonic beginning in 1958, which was subsequently embraced by orchestras around the nation, has morphed. 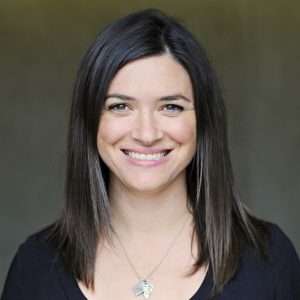 “What I loved about (the Bernstein concerts) was that they just took the standard repertoire and made it accessible,” said Stephanie, herself a highly trained classical clarinetist (and the mother of two). “Here’s this, listen to it and then let’s talk about it.” But ideas about reaching youngsters have changed, she added, as orchestras have become more sophisticated about ages and attention-spans. Moreover, she said, the Symphony has had to adapt to the demands of school systems, many of which will approve a “field trip” to the Kauffman Center only if it has some kind of “educational value” (read: math or science). “To them it means, are they going to learn about science, or are they going to learn about something they’re going to be ‘tested on’?” This might seem restrictive to some, but in the era of “core curriculum” it’s simply the world in which teachers and school systems live. 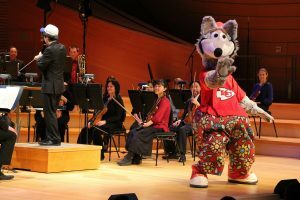 As one of the more forward-looking organizations in the United States when it comes to outreach, the Kansas City Symphony has in fact enjoyed enormous success in building relationships with schools, administrations, and students. Teachers keep coming back because the process “clicks” from start to finish.